Artist's conception of NASA's James Webb Space Telescope. Supporters of the James Webb Space Telescope united today (Sept. 21) to advocate for the ambitious project, despite its increasing costs and repeated delays. 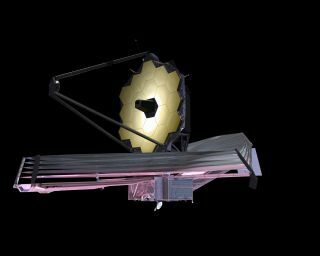 Some of the project's staunchest supporters, including the telescope's senior project scientist and NASA's program director for the mission, made the case for James Web during a web conference hosted by the Space Telescope Science Institute in Baltimore, Md., which will serve as the Science and Operations Center for JWST. The James Webb Space Telescope, a general-purpose infrared observatory, has been billed as the successor to the Hubble Space Telescope. Yet repeated difficulties have pushed its launch date back to 2018 and its budget up to $8.7 billion, at latest count. The U.S. House Appropriations Committee has even gone so far as proposing to scrap the mission, and zeroed-out the funding allocated for JWST in its fiscal 2012 appropriations bill. However, the Senate Appropriations Committee moved to save the telescope by increasing JWST funding in its version of the appropriations bill. The telescope will feature a 6.5 meter primary mirror that will allow glimpses into some of the farthest reaches of the universe. Proponents say it offers the chance to make huge breakthroughs in the study of star and galaxy formation in the early universe, the mysteries of dark matter and dark energy, and the search for planets around other suns. The observatory is a collaboration between NASA, the European Space Agency and the Canadian Space Agency. "I'm speaking as a heavy user of the Hubble Space Telescope, and, hopefully, a future heavy user of the James Webb Space Telescope," said astronomer Julianne Dalcanton of the University of Washington. "With the James Webb Space Telescope, things that are currently ambitious are going to become routine. The impossible is going to become possible. The capabilities, the more I've looked into them, I get increasingly excited about the science that I can do with this telescope." In reaction to some of this discontent, planetary scientist Jonathan Lunine of Cornell University, a member of the JWST Science Working Group, pointed out that James Webb will offer significant capabilities of interest to planetary scientists as well as astrophysicists, such as the ability to observe both planets in our own solar system and alien worlds around other stars. If some portion of JWST's funds must come out of NASA's planetary science budget, the investment would be worth it, he argued. "Between 6 to10 percent of Hubble time is used by planetary scientists," Lunine said during the web conference. "One expects that a large amount of JWST time will go to planetary topics. Matt Mountain, director of the Space Telescope Science Institute, agreed. "This isn't just an astrophysics mission, this is a science mission," Mountain said. The JWST team also stressed that many changes have been put in place over the last year, following an October 2010 independent review panel report that blamed budgeting and management failures for the project's significant cost growth and schedule delays. "JWST is on a new path," said Rick Howard, program director of the JWST Program Office at NASA Headquarters in Washington. "All of JWST senior management at [NASA's Goddard Space Flight Center] and headquarters were replaced. This is really our last chance to do this right. Everyone understands that, so we have been very careful to put together a re-plan that we feel is robust." Ultimately, whether or not NASA is able to follow through on the project will be hugely significant, the scientists said. "JWST is seen by people as a litmus test for whether the U.S. really wants to remain a leader in space," Abraham said. "There's no doubt that JWST is a big challenge. But getting JWST done is seen by the international community as a pretty clear message that the U.S. is still capable of doing really great things."